This issue of the American Science Fiction Magazine represents #19 (November 1953) in the Australian-published series of reprinted quality American fiction. It sports a rather simple, yet lovely cover illustration by the ever-competent Stanley Pitt. Pure pulp-action-crime-adventure with a splash of romance. Aliens are hitting Earth with an interplanetary assault, slowly cooking us and causing raging storms, until we all die or meet their ultimatum by surrendering and dismantling all our “arms.” In a race against time, a news reporter must solve the mystery of the alien race while trying to stay alive as a secret set of humans attempt to murder him. But when he learns that there is a genius human pool of personalities secret removed and living under an incinerating dome in the Pacific, he must find a way in and survive their [own] murderous plans. 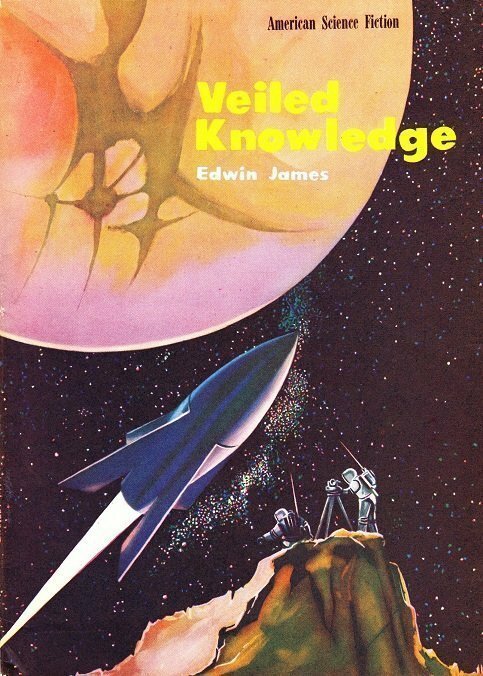 The title has actually numerous hidden [veiled] meanings in this story, and Edwin James handles each one adeptly. A brilliant tale. The filler short by Joquel Kennedy is just what it sounds like, and kids in space sans oxygen-masks or gear is always good fun on Mars. When a group of school kids roam free, nothing good can come of their explorations. Peter [Pug] Stevens discovers a “Martin” encased in glass under the sands of Mars. While trying to carry the case, he breaks it, and the being comes to life. Withered and frail, the being can scarcely move, but speaks via mental telepathy, and convinces them to bring him to an underground city where more of his kind are encased. Excited by their find, they agree, and in order to avoid a plot spoiler, let’s just say it doesn’t end pretty…. If you dig my blogs for Matt Moring’s awesome Altus Press, you may also be interested in my sister (er, brother, really) site, THE PULP AND PAPERBACK READER. Granted, I read and blog more upon vintage paperbacks than pulps, but many pulp stories were reprinted in paperback format, so you can have that argument, too.